INCLUDING the cables B-Box H/SBS and SMA Sunny Home Manager 2.0! The High Voltage BYD B-Box H 10.2 Battery Storage with SMA Storage 5.0-US is one of the most sold items in our shop. The BYD B-BOX HV comes in sections to allow you to build your battery to your required power, each section comes in 1.28 kW stacks which start at 6.4 kW and go up to 11.52 kW of usable power. This expandable system allows a lower cost of entry into self consumption/energy storage from your solar system allowing you to build over time. The system is compatible with SMA Energy Storage Inverters. 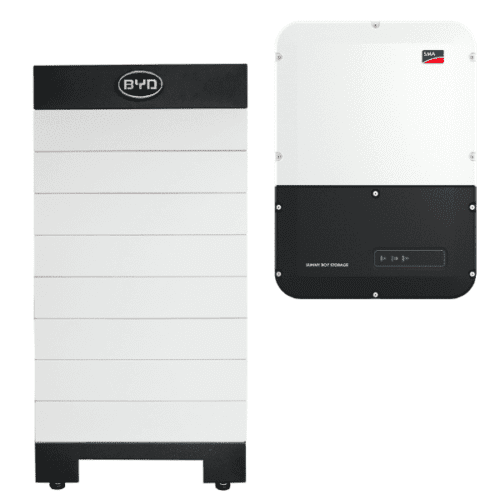 This version High Voltage BYD B-Box H 10.2 Battery Storage with SMA Storage 5.0-US would come with 8 x 1.28 kW Lithium Battery Stacks and the BMU which forms the base and top section of the package. B-Box is designed with LiFePO4 chemistry battery which has been widely recognized as one of the safest battery technologies. LiFePO4 chemistry features stable structures and its thermal runaway temperature is over 480℃. That’s 100% higher than NCM and NCA chemistry. It is designed for residential and commercial applications with absolute safety. As the world’s largest Electric Vehicle manufacturer, BYD brings railway and automotive battery standards to residential and commercial solutions: B-Box. 6+ years’ track records of large scale applications in Electric Vehicles ensure its safety and reliability. All products have been certified according to international standards including TUV, UL and CE. B-Box is equipped with modular design and smart BMS (Battery Management System), allowing extension throughout its lifetime. B-Box is designed with natural cooling providing optimum efficiency. Founded in 1995, BYD is a listed company on Hong Kong Stock Exchange and Shenzhen Stock Exchange. We principally engaged in IT industry mainly related to rechargeable battery business, handset and computer components and assembly services, as well as automobile business including traditional fuel-powered vehicles and new energy vehicles while taking advantage of our technical superiority to actively develop other new energy products such as solar farm, energy storage station, electric vehicles, LED, electric forklift, etc. Currently, BYD has nearly 180,000 employees and 22 industrial parks in global with an area nearly 17,000,000 square meters. Join our ZERO Home Bills Community. BEST Products from the BEST Brands at BEST Prices for ZERO Home Bills on ZEROhomebills.com by Solaranna.